Definition - What does Staff Pose mean? Staff pose is the foundational posture for many seated yoga poses. It is a seated posture with the legs outstretched in front of the body and the spine long and vertically aligned. The palms touch the floor beside the hips (or the fingertips can be used if the palms do not reach). Although staff pose looks relatively simple, it requires enough flexibility in the hamstrings and back of the body for the torso to make right angles with the legs. It also requires a strong core to hold the body upright, so it is considered a good posture for building inner strength. The Sanskrit name for staff pose is dandasana. The name “staff pose” comes from the resemblance of the straight, strong spine in this pose to a staff. It requires a great deal of engagement and awareness of the position of the body. The toes should be drawn back towards the body, the thighs engaged and squeezing together with slight internal rotation, and the core actively engaged to lift and lengthen the spine out of the pelvis. The level of engagement and awareness required in staff pose makes it an ideal preparatory pose for many of the seated postures. It is often followed by seated forward fold. The pose is beneficial for improving posture and alleviating tiredness in the feet and calf muscles. It is also thought to help relieve sciatica and asthma. 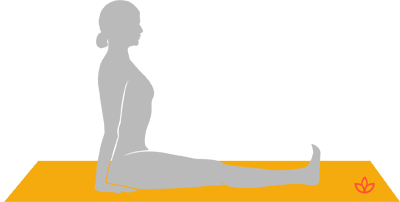 Staff pose can be modified for those with tight hamstrings by placing a block or blanket underneath the sit bones or the knees. It can also be practiced against a wall to feel the correct alignment of the posture.